In the age of digital media we are always looking for good content to share whether it be on our websites, in proposals or on social media. How do we make sure that we are representing our company and personal brands when posting photos of our jobsites? 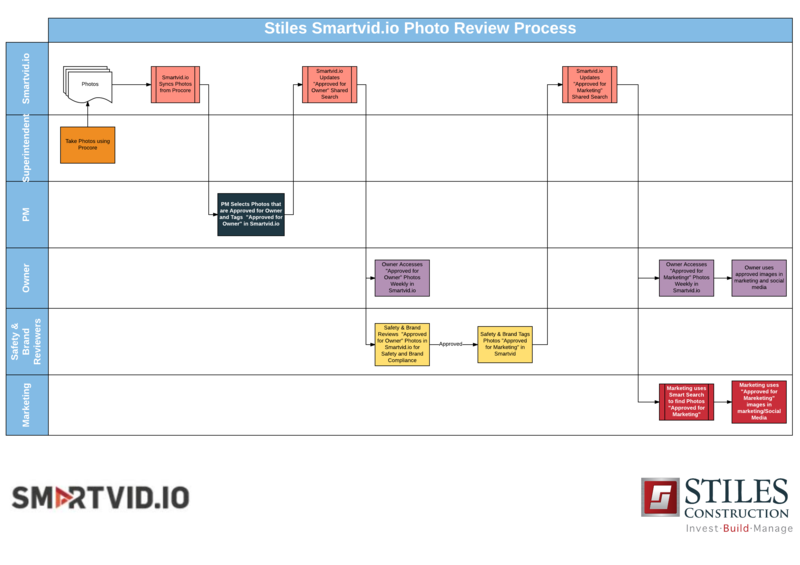 I believe that I have found a great workflow to control the messaging and branding of the photos that put out into the interwebs, its called Smartvid.io. Many of you probably know Josh Kanner (@jkanner1) and his team and how they have been working to incorporate Artificial Intelligence and Machine Learning (AI/ML) into the world of construction photos, but did you know they are building a pretty awesome marketing tool at the same time? Stiles (@stilesbuild) has been using Smartvid.io in a number of ways over the past year trying to find a sweet spot to maximize the ROI. As we all know collection photos and videos from the many devices of our field staff has always been a challenge and making sense of them is even harder. This is where Smartvid.io really steps in. With Smartvid.io integration into Procore (@Procoretech)now you can consolidate pictures accross projects and users. This is extremely powerful as it all happens in the background. Once the photos are in Smartvid.io you can start to use the powerful AI/ML tools that they make available to the construction industry. Search for images that have a picture of a crane, tag a video every time a super says the word safety, categorize photos of best practices, and share those photos and videos with others, these are all great examples of what Smartvid.io can do for you. As we are dealing with remote owners, bank and lending inspectors and the need to share progress of the project with other on a daily basis we have to be sure that we are putting our best foot forward. We have all seen the photos on Linkedin of workers being unsafe and the triage that ensues after that. So how do we make sure we are putting our best photos in the hands of others, in particular owners? Well Smartvid.io uses a system of tags and smart searches that can help with this process. Tag only the photos that you think are a good representation of yourself and share a smart search with the owner so they only see what you want them to. The process probably looks a little something like this. So those photos are for the owner’s eyes only but you want to market and sell your work and your company right? We need to make sure that those photos don’t have any safety violations and that they align with your brand messaging prior to sending them out to the world. We have put in a review process that allows a team of safety personnel and executives to review all photos before they are approved for marketing. We can then share this set of images to our business development team, marketing team and even the owner’s marketing team in some cases. This allows us to control the messaging that goes out with this photo. In the end this gives us more control over our content. I know this was a relatively quick overview of what we are trying to do with Smarvid.io and only touches on one part of it but I have good news, we will be presenting this and more on a webinar on the June 20th at 1PM EST. You can register for Tapping Into the Power of Construction Photos and learn more about this process and more at what I think will be a great learning experience for everyone.